Something for everyone at this park – 2 playgrounds (including slides coming out of a rocket ship! ), mini putt (see under ‘contacts’ for more details), outdoor pools in the summer months and a miniature train. There are also BBQs, lots of grass for running around on and big old trees providing shelter for a picnic. The train operates year round – weather permitting with petrol, diesel and even mini steam trains running on different weekends. There’s more than one circuit but all have at least one tunnel. Great for train enthusiasts young and old! Check here for more train info. The pool is only open in the summer months and has a learners’ pool and lap pool. See under ‘contact info’ for more details or here for the pools’ own website. Address: The park is bordered by Eleventh Avenue and Devonport Road, Tauranga. 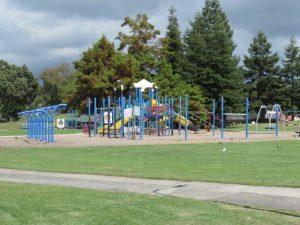 The closest access to the playground is Fraser Street (street parking possible). Mini Putt is off Eleventh Ave, near the Queen Elizabeth Youth Centre with street parking near the ticket desk an option. Train: 53 Eleventh Avenue. Operates Sundays year round 10am – 3pm in winter and 10am – 4pm rest of the year, weather permitting. Price: $2 per ride with under 2s free. Pools: off Devonport Road. Open Labour Weekend (end of October) – April, from 6am – 6.30pm Monday – Friday and 9am – 6pm Saturday, Sunday & Public Holidays. Phone 07 577 8554 for more details.